Sometimes little things can make a difference. Gmail's updated loading screen makes Google's mail service look more like a native app and the transition to the actual interface is much smoother. The progress bar and the "loading" message are now centered and no longer look like an afterthought. 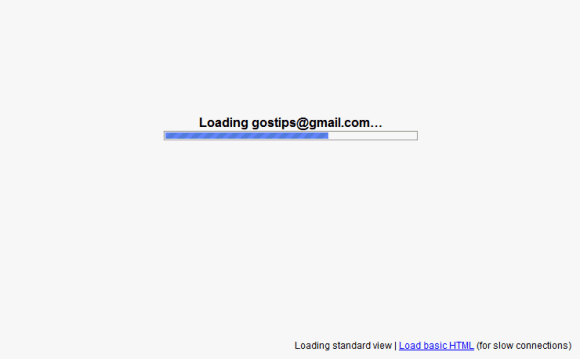 In the new Gmail interface you'll also see the loading page when you pick a different theme and that's annoying. If you have a slow internet connection, you can enable the "inbox preview" lab feature to see a preview of the inbox while you wait for Gmail to load. Just noticed this too. Thought I could give you the scoop,but alas you already have it. Drats ! On the ball to day alex, I suppose it the little things that matter, how long do you think this took an engineer to do, 5 minutes, 10 tops. Nice improvement through, through when my connection decent I barely notice the loading screen at all anyway, 1 or 2 seconds tops, I surely virtually zero on a descent connection. I still use the "Inbox preview" labs feature, so I doubt I'll be affected by this. I was going to send you this! I like it. It could be that it's just something new, so something seems different but I feel like Gmail loads faster now. It's nice but it breaks inbox preview labs. Hope that gets fixed. the new loading box is pretty. Even google can get something right once and awhile. Is pretty standard feature. No news here move along. I hate it.. Looks utterly cheap/ugly!